The manager had a problem with team selection but few of the 704 'Well fans will feel that he made the correct choice to compensate for the missing midfield pair of Lasley and Grimshaw. He elected to introduce Chalmers at left back and to switch Hammell to right back. The effect was to have an unsettled back line and midfield and it failed horribly. We held out for all of ten minutes before the first of half a dozen was conceded. McManus had by then already made a couple of decent blocks but when the assistant decided that Chalmer's headed clearance was on the wrong side of the goal line Hearts had the early goal to set them up. The home crown had to wait less than five minutes for the second. We had produced our best attack of the first period and Ainsworth finished it off with a weak shot on target before the ball found itself at the feet of Sow 25 yards out and his low drive beat our 'keeper at his left hand post. Ripley got a break when the referee gave him the benefit of only a yellow card after he upended Reilly to concede a penalty. We were then three down after 20 minutes and out of the contest. 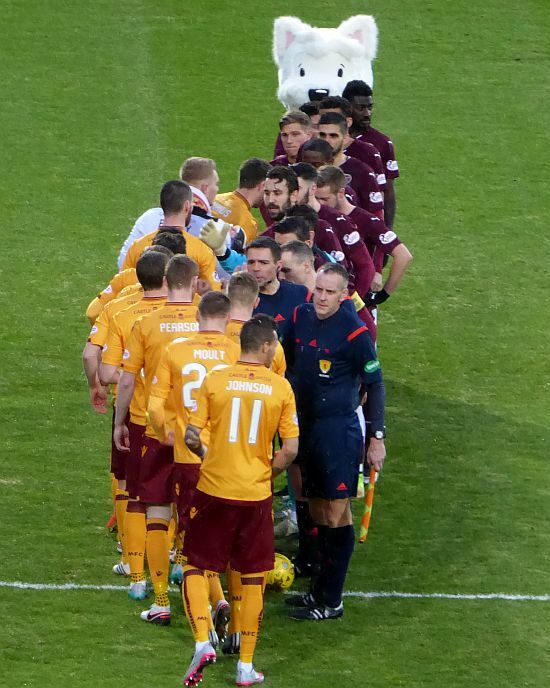 After the match McGhee bemoaned the lack of energy and determination that had served us so well in recent weeks but the unfamiliar line up played a big part in our downfall. A combination of some stiffer resolve and the opposition taking things a little easier allowed us to hold our own for much of the second half. We fashioned a couple of decent chance. First Johnson delivered a cross for McDonald at the far post but the header went wide then Fletched nicked the ball, charged into the box but Alexander got a touch to end our hope of scoring. Paterson's low shot heralded the start of a collapse in the final fifteen minutes. Juanma grabbed the fifth before Clarkson conceded a second penalty for the sixth in the last minute. We have to dismiss this defeat and hope to get back to normal service next week.